As you head outdoors during the spring and summer, bask in the beauty of the Ozarks. In the local area we are surrounded by many opportunities to get in touch with nature, by hiking, canoeing, camping and a myriad of other activities. This is the first in a two part series looking at animals that surround us here in southwest Missouri. Dr. Brian Greene, herpetologist at Missouri State University, explains his research, and his interest in snakes. Often times snakes get a bad rap. They’re usually more frightened by you than you are of them, and you’ll most likely overlook them if you’re trekking through the woods, added Greene. 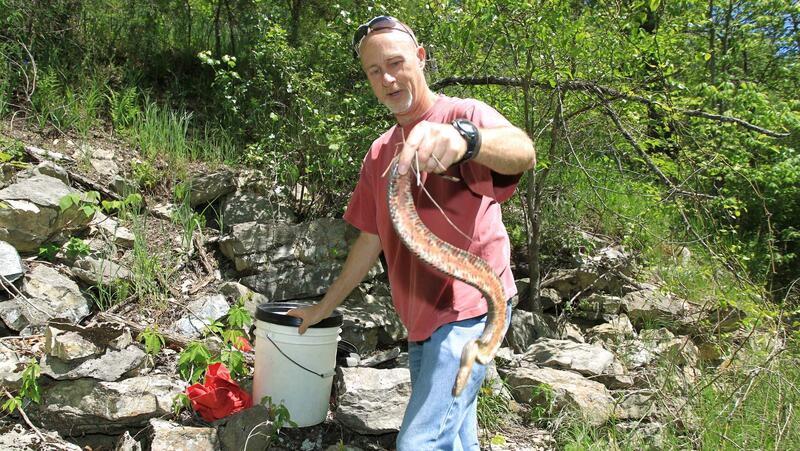 He explained that there are four venomous species here in southwest Missouri, including two rattlesnakes. In order to identify whether a snake is venomous or not, Greene says most of the features would require that you get close enough to touch. But Greene doesn’t think people should be too frightened. He studies the ecology of snakes, which encompasses pretty much any behavior of an animal in their natural environment. One of his primary research subjects is the western cottonmouth, and recently, he’s made some interesting discoveries about the species. Though people generally are fearful of snakes, Greene points out there are several thousand people a year bitten by snakes, and fewer than 10 deaths. On top of that, Greene said, snakes are great for research. As statistics show a trend toward a more urban market, or people moving to cities, an opportunity arises for rural areas to capitalize on the quaint weekend in the country, according to Linnea Iantria, director of the geotourism program at Missouri State University. In spring 2015, she and her students created the Homegrown Highway as a throwback to a rural road trip with unique experiences built in that would increase tourism in rural Missouri. Across many cultures and for many years, if you’re feeling under the weather, chicken noodle soup would be offered for comfort. But why? e Jordan Hawkins, senior research scientist at Missouri State University’s Center for Biomedical and Life Sciences, is conducting research on International Dehydrated Foods’ chicken broth products and their relationship to inflammation and pain. This research has been funded by several grants from IDF totaling more than $100,000.